All of these crazy acronyms these days, and here’s the latest: FOMO. Not familiar? If you fail to heed my warning, soon you’ll be experiencing the negative effects firsthand. In other words, FOMO stands for “Fear of Missing Out,” and yes, you should be very, very afraid. For a limited time and with a limited amount of stock, I’m offering up 20 CAO Blackcigars for as low as $49.50, saving you nearly a hundo off MSRP on 3 juicy sizes. 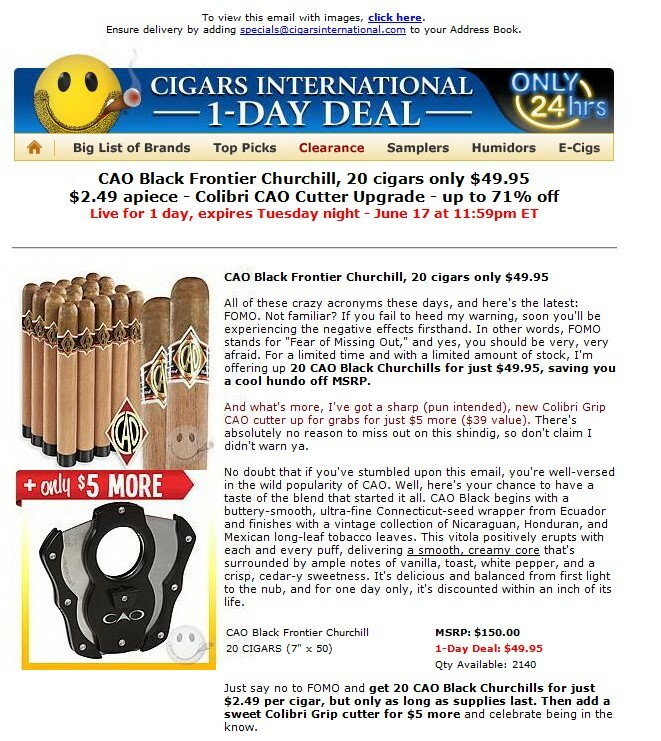 No doubt that if you’ve stumbled upon this email, you’re well-versed in the wild popularity of CAO. Well, here’s your chance to have a taste of the blend that started it all. CAO Black begins with a buttery-smooth, ultra-fine Connecticut-seed wrapper from Ecuador and finishes with a vintage collection of Nicaraguan, Honduran, and Mexican long-leaf tobaccos. Each cigar positively erupts with each and every puff, delivering a smooth, creamy core that’s surrounded by ample notes of vanilla, toast, white pepper, and a crisp, cedar-y sweetness. It’s delicious and balanced from first light to the nub, and for one day only, it’s discounted within an inch of its life.